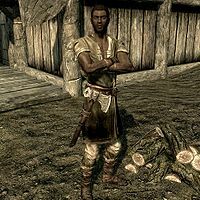 Azzada Lylvieve is a Redguard farmer living in Dragon Bridge with his wife Michel, son Clinton, and daughter Julienne. He grew up an orphan in Markarth, but was taken in by an old Nord warrior who helped him escape the city. Azzada wandered until he found and fell in love with Michel, with whom he settled down to start a family. Azzada wears a set of farm clothes, a pair of gloves, and a pair of boots. In battle, he relies on an iron war axe. He carries his house key and a collection of common loot and gold. He wakes up at 6am to cut wood for a long twelve hours, skipping lunch with his family due to an oversight (see bugs). He'll hang outside in Dragon Bridge from 6pm to 8pm, after which he'll head home to have dinner with his family for two hours. He'll hang out in his house for the rest of the time, heading to bed at midnight. He will pay you to harvest cabbage, potatoes, and wheat. He welcomes you to his town when he greets you: "Welcome, traveler. Mind yourself in our town." He seems happy with his life, often remarking: "Got a loving wife, a healthy son and a patch of land to call my own. What more could a man ask for? ", "We aren't a big city like Solitude or Markarth, but we like it this way." or "If it weren't for Michel, I'd probably be dead in a Markarth gutter by now." He's also observant of the people who travel through the town: "Seen some mean-spirited folk pass through lately. Thought I was rid of those sorts when I left Markarth." When asked if he's worried for his family because of the war and dragons, he'll explain: "Of course. Every night I pray that we don't get a visit from a dragon, or that two armies don't show up to fight over the bridge. You ask if I'm worried? I'm terrified, if you want to truth of it. But I have to stay strong for my wife and children." When you ask about mean people passing through, he'll rant: "Both the Imperials and Stormcloaks have sent riders this way, scouting the bridge and the lands nearby. They stayed at the inn, but didn't pay. They said soldiers don't need to pay because they're risking their lives to protect us. And that's not all. They took a heap of our lumber, and one tried to have his way with my daughter. They think they can do whatever they want." When asked if he came from Markarth, he'll confirm: "I grew up an orphan on the streets of Markarth. I'd have died there, too, but for the kindness of an old warrior named Logrolf the Bent. Logrolf rescued me and gave me enough money to get out of the city. I followed the Karth river north, and came here. When I met Michel, I knew this was where I belonged. I suppose that's it, really." Michel: "Did you read that letter from Markarth yet?" Azzada: "Yes, just this morning. It was from Logrolf. He wrote to thank us for the food we sent." Michel: "And how is that old warrior doing these days?" Azzada: "Not well. He's convinced that his house is haunted, so he's sleeping on the street." Michel: "Oh dear. I wish there was something we could do to help him." Azzada: "As do I. That man saved my life. I hope that someone helps him, as he once helped me." Clinton: "Father, how come Olda's so mean to everyone? She's only ever happy when she's with Lodvar, and she's not even married to him!" Azzada: "That's no business of yours, son. Mind you keep your nose out of it." Azzada was supposed to have lunch with his family from noon to 2pm, but his work package overrides this.